The Johnston Center for Integrative Studies has hosted the Race on Campus conference at the University of Redlands every year since 2016 to discuss cultural issues and experiences. This year, it was held on Sunday, March 31 in a collaborative weekend with the Women, Gender, and Sexuality Studies Student Conference and a powwow honoring Native traditions. Before attending the Race on Campus conference for the first time this year, I didn’t know what to expect, yet I left impressed by the efforts of students in their willingness to discuss uncomfortable subjects. Amma Fordjour ’18 in her session “What it Means to Dig: The Art of Liberating Yourself” spoke about a journey of self-acceptance. She majored in chemistry during her undergraduate studies at Redlands, not because she had a passion for it, but because her parents wanted her to become a doctor. Fordjour identified personal introspection as what helped her recognize she wanted to pursue a career as an artist, despite the wishes of her parents. 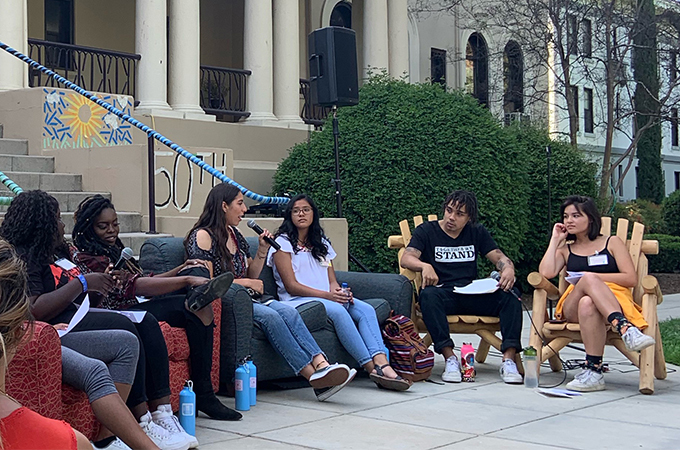 In “Mexican-American Access to Education,” Aiden Bazzal ’20, Adriana Alvarado Sandoval ’22, and Julie Garcia ’21 gave a rundown on the difficult history of Mexican Americans’ entry into public schools. Sal Castro and other influencers in the education movement, such as the Brown Berets, were highlighted. In between sessions, lunch and dinner were provided on the Bekins lawn. Musicians Birote the Musical and Inaijsa and Hamza performed wonderfully unique sets during both meal times. I saw several friends and familiar faces throughout the day and noticed everyone was eager to listen or partake in dialogue surrounding diversity and race. The atmosphere was one of a learning environment without judgment. Student-led events such as Race on Campus are powerful because they’re constructed by young people. From multiculturalism to racism, suicidality, and environmental justice, youth were in command of each and every one of these conversations. Hearing fellow students speak with passion and vulnerability on the subjects near and dear to them proved to be the most memorable part of the conference. Music, food, and positive energy helped transform complex dialogue on race from something formidable to instead an approachable task. Race on Campus, for me, presented the intelligence and bravery of my peers, in addition to acting as a display of our generation’s desire and capacity to create change. Read more about U of R’s Johnston Center for Integrative Studies and the Race and Ethnic Studies Department.